Brief：President Xi Jinping and President of Turkmenistan spoke highly of the development of China-Turkmenistan relations, jointly planned for the future cooperation between the two countries and decided to establish the China-Turkmenistan strategic partnership. 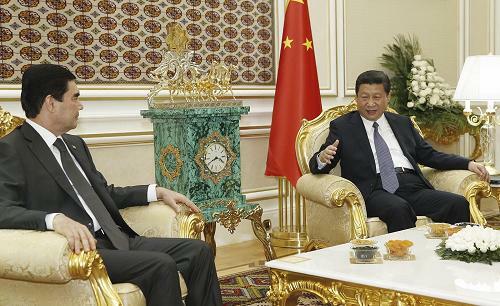 On Sep. 3, 2013,President Xi Jinping held talks in Ashgabat with President Gurbanguly Berdymukhamedov of Turkmenistan. The two heads of state spoke highly of the development of China-Turkmenistan relations, jointly planned for the future cooperation between the two countries and decided to establish the China-Turkmenistan strategic partnership. Xi Jinping expressed that the friendship between China and Turkmenistan enjoys a profound historical and cultural foundation. In recent years, the two countries have enjoyed a high degree of political mutual trust with fruitful cooperation in the fields of economy, trade, energy, people-to-people and cultural exchanges. China has become the largest trade partner of Turkmenistan. Both sides are the largest natural gas cooperative partners for each other. It has played an important role in promoting the economic development of the two countries and set a good example for global energy cooperation. China and Turkmenistan are strategic partners in a real sense. China will unswervingly adhere to the policy of friendly cooperation towards Turkmenistan and be a good friend, a good partner and a good brother of Turkmenistan forever. Berdymukhamedov said that Turkmenistan and China are friendly close neighbours and the ancient Silk Road linked the two peoples long ago. Bilateral cooperation in all fields has enjoyed a high-leveled development in recent years, especially both sides have established stable and reliable cooperative partnership in the energy sector. The Turkmen side is grateful for China's respect and support for Turkmenistan's domestic and foreign policies. Facts prove that China is a reliable partner of Turkmenistan. No matter how the international and regional situation changes, Turkmenistan will take developing the relations with China as a priority for its diplomacy. Turkmenistan is willing to work with China to carry forward the traditional friendship and to achieve common development. It is believed that President Xi Jinping's visit will surely boost bilateral cooperation and open up a new chapter for Turkmenistan-China relations. Both heads of state decided to upgrade the Turkmenistan-China relationship to a strategic partnership for mutual support, mutually beneficial cooperation and friendship for generations. Xi Jinping raised the following proposals on deepening bilateral cooperation. First, to firmly support each other's efforts in safeguarding state sovereignty and security as well as territorial integrity, and in promoting social and economic development, to firmly support each other's development path chosen in light of national conditions. China supports Turkmenistan's adherence to the policy of permanent neutrality. To keep close high-level exchanges, to expand communication between the governments, legislatures and political parties. Second, to accelerate the construction of Line C of the Turkmenistan-China natural gas pipeline, to launch the construction of Line D as early as possible, to well implement the exploration projects of the gas field on the right bank of Amu Darya River and of the Galkynysh gas field, so as to expand the scale of cooperation and to broaden the area of cooperation. Third, to enhance the scale and quality of bilateral trade, to expand cooperation in non-resource sectors, including infrastructure, agriculture, communications, electric power, health care and high-tech cooperation, to actively boost connectivity, to facilitate personnel exchanges between businesses. Fourth, to promote exchanges and cooperation on culture, education and sports, to strengthen people-to-people exchanges, especially between young students, to work together to ensure the success of the Chinese Culture Day in Turkmenistan this year and of the Turkmen Culture Day in China next year. Fifth, to strengthen cooperation on law enforcement, security and defense, to join hands combating the "three evil forces" including the "East Turkistan" as well as transnational organized crime, so as to safeguard common tranquility of the two countries and to ensure the safe implementation of large cooperation projects. Sixth, to enhance communication and coordination in regional affairs, to jointly resist against external forces undermining peace and stability of Central Asia, to support an "Afghan-led and Afghan-owned" reconciliation process in Afghanistan, in order to contribute to development, prosperity and long-term stability of the region. Berdymukhamedov expressed that Turkmenistan firmly supports China on issues concerning China's core interests and major concerns. Bilateral cooperation is based on equality, mutual trust and mutual benefit. It will help the Turkmen side leverage its advantages in resources, to diversify the economy. Turkmenistan is willing to increase natural gas supply to China and to accelerate the construction of relevant natural gas pipelines. The Turkmen side hopes to expand bilateral cooperation in the fields of economy, trade, agriculture, textile, chemical industry and infrastructure construction. It welcomes Chinese businesses investing in Turkmenistan. Both sides should conduct people-to-people and cultural exchanges, to enhance mutual understanding and friendship. The two countries share common interests in combating the "three evil forces" and in safeguarding regional security and stability. 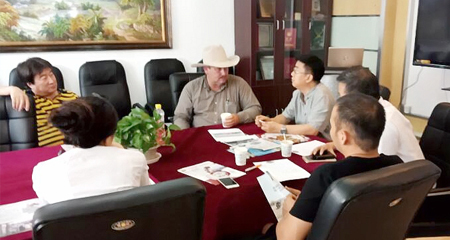 They should strengthen cooperation on law enforcement and security. Turkmenistan hopes to maintain coordination and cooperation with China in international and regional affairs and supports China for hosting the foreign ministers' meeting on the Istanbul Process of the Afghanistan issue next year. Following the talks, the two heads of state signed the Joint Declaration on Establishing Strategic Partnership between China and Turkmenistan, and witnessed the signing of a number of cooperation documents in the fields of diplomacy, economy, trade, energy, forestry, education, sports and local cooperation. The two heads of state as well met the press. Xi Jinping stressed that the upgrade of China-Turkmenistan relationship to a strategic partnership marks that bilateral relations have entered a new stage of development and will usher in broader prospects for development. The natural gas cooperation between China and Turkmenistan is strategic, long-term and forward-looking. It fully embodies the high level of bilateral political mutual trust and the features of complementary advantages, mutual benefit and win-win outcomes. Both sides should be long-term, stable and reliable strategic partners in the energy sector. The two countries should as well expand cooperation in non-resource fields to bring more benefits to both peoples. Prior to the talks, Berdymukhamedov at the Presidential Palace held a grand welcome ceremony for Xi Jinping. Xi Jinping upon the arrival was warmly greeted by Berdymukhamedov. The two heads of state walked side by side into the Hall of the Presidential Palace and mounted to the inspection platform. The military band played the national anthems of the two countries. Xi Jinping, accompanied by Berdymukhamedov, inspected the guard of honor. The ten Deputy Prime Ministers of the Turkmen government as well as foreign ambassadors to Turkmenistan and representatives of international organizations attended the welcome ceremony. Xi Jinping introduced the Chinese accompanying officials to Berdymukhamedov. Xi Jinping also laid a wreath before the Memorial Hall of Saparmurat Niyazov, the late first President of Turkmenistan, the same day to cherish the memory of the founder of the friendly relations between China and Turkmenistan. Soon afterwards, Xi Jinping visited the Monument of Independence of Turkmenistan to lay a wreath and planted a firry tree symbolizing the friendship between China and Turkmenistan in the forest of heads of state.